Is it even possible to cash out on this site or do they just cruelly string you around, leaving you just within reach of 15. According to the most recent reviews here at SP, at least 1 other person had the same complaint. It is possible. 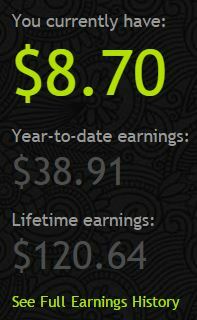 I've already cashed out once, and I'm currently sitting at $9.73 for a second cashout. I only signed up ~4 months ago, and I just maxed out at 10k traitscore about a week ago. I do have to wonder whether you're relying on them to email you with surveys (either trait ones or real ones)? Because they... don't. Other than that, I think it's a pretty decent site (it admittedly doesn't pay much total, because there aren't too many surveys, but the surveys they do have work, and pay decently for the time cost), but it's wacky how infrequently they notify you of surveys. I've completed dozens of surveys for them (both the little trait ones and larger real ones), out of which I've been emailed about like... 6 of them. The most recent survey I completed for them was yesterday; the most recent survey I was emailed about was in freaking September. I don't remotely understand why they even bother having settings for notifications, if they're never going to use that feature. I just check the site periodically. I emailed them about that a few weeks ago, and the response was basically a non-response. So I dunno what's up with that. I just check the site periodically. That's the only reliable way to catch surveys especially when you get close to cashing out. Randomly check the website 2 or 3 times a day. Don't rely on email invites. Maxing out the trait score does absolutely nothing to increase your earnings. It is possible to cash out multiple times. Also I lied. I just checked, I've actually cashed out twice, and that number was for my third cash-out (and it's at $10.74 now ). But feel free to pester them about why they claim they'll email you with notifications, but then never, ever actually do that (apparently intentionally). UPDATE: since the trait survey which inspired this post, I've been getting them more frequently. After the fifth one, I was finally able to bring my trait score up past 9000. I just need one more real survey and then I should be able to cash out. I gave up on Paidviewpoint several months back as all they sent were the trait surveys worth next to nothing. They NEVER sent me an actual survey, and I never encountered one on the site itself. Found the whole situation annoying and lame as they were wanting me to waste my time building up some sort of 'trust' level with the trait surveys, then never sending anything. What's the point when I can make more on other survey sites in a few minutes than what I built up on this one in several months? I don't get it, either; I don't recall getting an actual survey the whole time I've been with them. Thanks, tho whoever mentioned checking the site daily, as I haven't been doing that. I'm not far from payout, so will do that and see how it goes. I usually check their site every other day and find a trait survey. Once I reached 10,000 nothing happened. They said I get far more than the average 10 cents per survey for having a 10,000 trait score but I still get 10 cents. The other day I did do pretty well. In a short period of time I got two surveys one right after another and made 49 cents. That's rare. Is anyone still with this one?? I am, and as 1cent2help states, I still only get 10 cents for most surveys; they've been paying ok, though. I am. Took awhile to get to the 10,000 max trait score, but once I did I starting getting more surveys, and they pay a bit more, but rarely as much as one dollar. Is adding up faster for me now than a few months ago though.